When I first moved to Vienna in 2007 and explored the different neighbourhoods in walking distance to where I lived, I made it to the Eastern parts of Margareten at some point and quite liked it: Nice bars and cafes, all sorts of interior design stores, independent run shops and boutiques and little plazas where people liked to sit and stay - relatively little of the pomposity that you find almost everywhere else in Vienna. This seems to be a relatively recent development, though - whenever I invite Viennese to meet me there and they arrive, they usually take a good look around, smile and say something like: "Wow, this has become really nice!". Margareten - and especially the area close to the Wienzeile and Naschmarkt - had a reputation for being a run-down area with cheap residential houses, lots of drug traffic and very few historic buildings. Whilst the area is now popular with a young and educated crowd, it is still rather poor in sightseeing attractions. 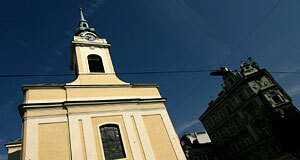 One exception is the small Baroque church of St. Joseph, also called "Sonnenhofkirche". Like most of the suburbs and villages of Vienna, the area of Margareten was completely destroyed by the Ottoman armies in the course of the Second Siege of Vienna in 1683. This applied to a local palace and a former church on the site of St. Joseph. After the Turks were defeated, the now open land was cheap and many noblemen purchased properties to build summer palaces (for details, see my article on the "Palais of Vienna"). The area around today′s St. Joseph was purchased by Sir of Oppel, who fixed a local palace called Schloss Margareten. Oppel′s son, Count Anton of Sonnau, built an administrative house called "Sonnenhof", which was sold to the city of Vienna in 1740. After that, it became a shelter for the poor and homeless and in 1765, the shelter was equipped with a little church. According to plans by the little-known architect Franz Duschinger, the main nave was built within four years - but then the shelter ran out of money and the interiors of the church remained incomplete, the twin-towers that had been planned were not built. Nevertheless, the church was opened with much pomp and circumstance by the Archbishop of Vienna, Count Christoph Anton Migazzi and in the presence of Empress Maria Theresia and her son, the later Emperor Joseph II, in 1771. Now for the funny bit: The central tower was built only in 1903! In 1912, the choir stalls and frescoes were made - just like the tower in a rather sensitive neo-Baroque style. Most of the interiors arrived much earlier, somewhere in between the 18th and 20th century - but most alters, paintings and decorations are authentic artwork from the 18th century. On the outside, there are four statues of saints made of limestone as well as a memorial plate that commemorates Franz Schubert. After his death, the composer′s body was laid here in 1828. For more places on where Franz Schubert got laid, see my article on the Dreimäderlhaus. There is a 19th century historicist house on the site of the former Sonnenhof, which now bears this name. Attractions nearby are sparse - see my article on Margareten for a general guide to the district. The Naschmarkt is in walking distance, and so is the area of Gumpendorferstraße with the Apollo Kino and the Haus des Meeres.